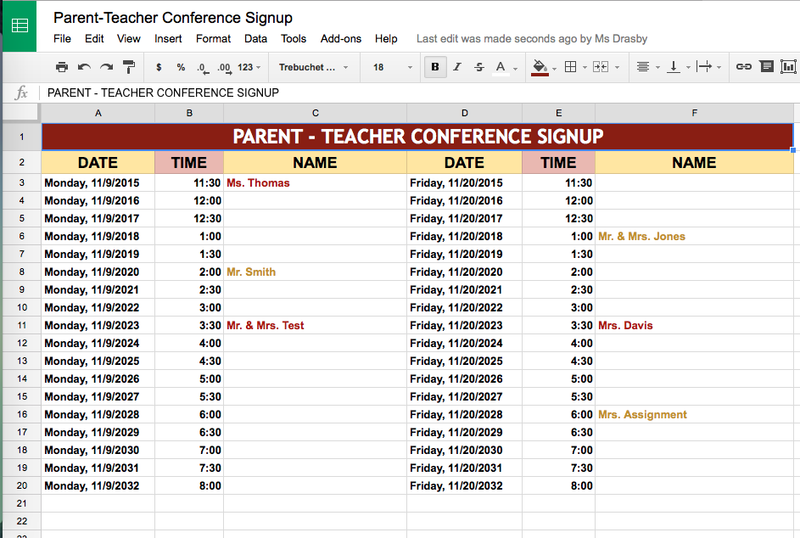 Use a Spread Sheet for Parent Teacher Conference Day Signup! The beginning of a new school year is just around the corner, and teachers are starting to plan for the coming year. It is exciting to see the conversations as I scroll down my Twitter Feed. Many teachers are looking for new ways to integrate technology. Today I saw this question from Emily Spooner Smith @ESpoonerSmith about Parent Teacher Conference Day Signup. Ms. Spooner-Smith is always looking for new innovative ways to integrate technology into her classroom. I quickly answered back use a spreadsheet shared to edit by public with a link. This makes it possible to share the spreadsheet for parents to add their name to a time slot. Don’t be shy and please add a fictitious name for signup! Thank you Ms. Spooner-Smith for being an Innovative Teacher! I would worry that using a shared spreadsheet might violate student data privacy rules. Isn’t it a concern if you’re publishing names or students and parents publicly on a shared doc? Warren you make a very valid point. In my humble opinion I believe teacher’s websites and blogs should be set to private with separate logons and passwords for parents. My thought is this would help avoid any privacy issues from arising if the spreadsheet is shared in a semi-private manner such as described above. I ask this, “What is the differences with having a paper copy signup sheet open to all the classroom parent’s to view on open school night?” Same parents viewing the information whether paper or digital. If you really want to be compliant then use a Google Form for signup however this would make more work for the teacher because potentially you would have parents signing up in the same time slot.